Ben Rush was enjoying the last week of the Ada Pool being open on Tuesday evening. The Ada War Memorial Park will be busy this Saturday, August 11. Along with the F & M Picnic, the pool will be open from 1pm - 8pm and will be free to get in. This will be the last day swimmers can enjoy the pool this season. ADA — Though there’s still nearly two months left of summer — autumn officially begins on Saturday, Sept 22 — for Ada’s primary and secondary school kids, summer is nearly over. Classes resume next Wednesday, Aug. 15, signaling the end of yet another summer vacation. But there’s still time for one last Hoorah! 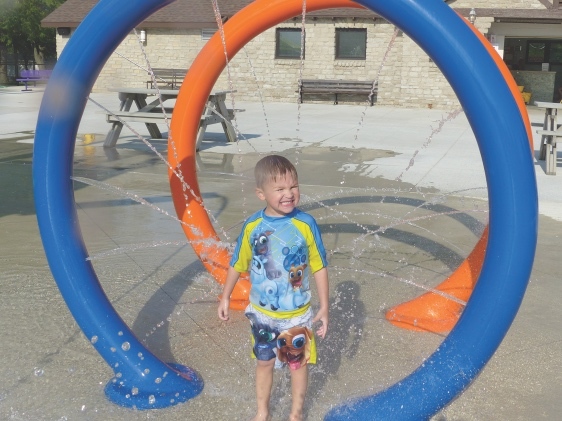 This Saturday, Aug. 11, the Ada Lions Club has cornered the market on shares at the Ada Municipal Pool. For this one day only, the pool is open free to the public. As in years past — and always thanks to the philanthropy of the Ada Lions Club — this event coincides with Ada’s annual Farmers and Merchants Picnic. The only potential fly in the ointment? The caveat “weather permitting.” As of Wednesday, The National Oceanic and Atmoshperic Administration predicts a 50-50 chance of rain/thunderstorms.